January has definitely started in a positive manner, as I made my 2nd win of the year, plus I also managed a 3rd place in another. Making it 3 final tables for the year and 2 wins. 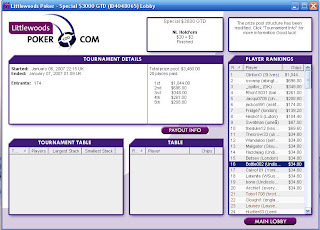 The win came in the $3k GTD which had 174 runners and $1044 for first place. My 3rd place in the other tournament also generated $534 in winnings. Well done to Lynchem who won thoroughly deserved his win in that tournament. Unfortunately my Mid Month Leaderboard competition started in disastrous fashion. When going nicely my all in reraise with AQ was called by AT. Flop TT5. Ouch. The guy that knocked me out with that mny75 only lasted 16 places longer! So I have 9 points from day 1. A lot of catching up to do. The competition does run until the 25th so time is on my side. Leaderboard investement £53 Returns £0. Points 9. Position - Well off the pace! MTTs are really my game at the moment and I am going to stick to them until I can build a bankroll that will allow me to try my luck at the STT and Cash world of poker. I did manage one win at a STT earlier though to qualify for the £12k. Thanks to Joe (The Deacons) note earlier. Don't you worry that I am going to go off around the world and throw everything away. Every win so far has been invested back into property (ie the house) and I am not thinking of only playing poker full time, just want it to be a bigger part of my life. I am not foolish enough to think that I am a world beater and it is the answer to everything, however I do have a bit of skill for this game and want to maximise my return on my investment. I am pleased to already have 2 tournament wins under my belt after 6 days this year. I am hoping my target for 2007 of 10 is well beaten! Your SNG form seems pretty poor and costing you money. Do you think you can turn this around or are you just thinking of playing MTT's only?